Source: O'Brien CP. 1996. Drug addiction and drug abuse. In: Harmon JG, LimbirdLE, Molinoff PB, Ruddon RW, Gilman AG, Editors Goodman and Gilman's The Pharmacological Basis of Therapeutics. 9th Edition. New York: McGraw-Hill. Pp. 557-577. Suboxone Treatment- The beginning level and length of treatment is determined on an individual basis. Some of the main variables used to determine the amount of suboxone prescribed are amount of opiates a person is using, and length of usage. Tapering this medication is often a key component for successful recovery or getting to a low level that allows the client to lead an unimpaired lifestlye. Naloxone counteracts the effects of opioids and is used to treat overdoses. Naltrexone, a derivative of naloxone, is an orally active and long acting potent pure narcotic antagonist. Naltrexone for opiate addicts usually is conducted in outpatient settings although initiation of the medication often begins after medical detoxification in a residential setting. Naltrexone is a long-acting synthetic opiate antagonist with few side effects that is taken orally either daily or three times a week for a sustained period of time. Individuals must be medically detoxified and opiate-free for several days before naltrexone can be taken to prevent precipitating an opiate abstinence syndrome. When used this way, all the effects of self-administered opiates, including euphoria, are completely blocked. The theory behind this treatment is that the repeated lack of the desired opiate effects, as well as the perceived futility of using the opiate, will gradually over time result in breaking the habit of opiate addiction. Naltrexone itself has no subjective effects or potential for abuse and is not addicting. Patient noncompliance is a common problem. Therefore, a favorable treatment outcome requires that there also be a positive therapeutic relationship, effective counseling or therapy, and careful monitoring of medication compliance. Project Echo- Integrated Addiction and Psychiatry (scroll down the right side for suboxone/buprenorphonine information). Extended-Release Injectable Naltrexone. I don't know much about this new type of naltrexone. I attended a conference and know that some recovery programs have begun to utilize this option. A person receives the shot once per month which may help if a person has a job or transportation issue.... additional counseling should still be sought. Methadone Treatment - Methadone eliminates withdrawal symptoms and relieves craving. It has been used for over 30 years to treat people addicted to opioids. Methadone is an opiate that was first introduced after World War II as an alternative to morphine. Methadone was originally thought to be less addictive because of its extremely long half life. Today, methadone is used as an analgesic for pain management and more popularly as replacement therapy for heroin and other opiate addictions. 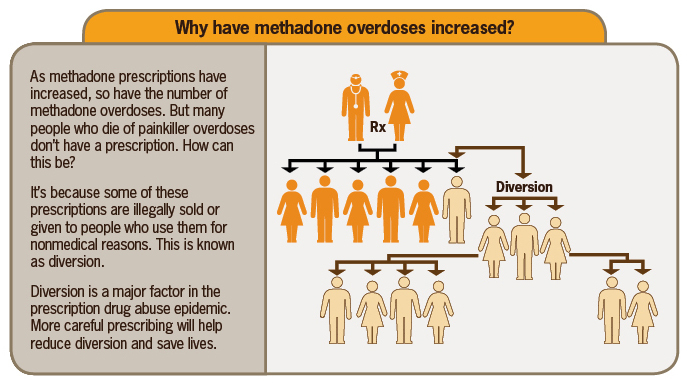 Methadone is a cheap alternative to other opiate based medications which outweighs it potency when prescribing. Patients stabilized on opiate agonists can engage more readily in counseling and other behavioral interventions essential to recovery and rehabilitation. The best, most effective opiate agonist maintenance programs include individual and/or group counseling, as well as provision of, or referral to, other needed medical, psychological, and social services. Attending NA/AA meetings will greatly improve recovery process and build a support system. FYI- The medical professional, typically a psychiatrist, prescribing Suboxone will meet with the client to see how the medication is work but does not counselor the person with addiction issues.... find a therapist, psychologist or other professional to provide this counseling.